Focus: Cash continues to gain strategic importance as an investment asset class in the current deflationary stage of the long term economic cycle which has persisted, in indebted developed western markets, since the turn of the millennium. As one of only three asset classes expected to outperform during this 15 to 25 year phase, it has become increasingly important not only to allocate an adequate proportion of investment portfolios to cash but also to actively manage that money in order to achieve optimal returns in a low or zero interest rate environment against a backdrop of ongoing fears of a global depression. * Strategically managing asset allocation with due regard to the risks and rewards of each asset class - recognising the three most suitable asset classes for this long term phase (namely gold, bonds and cash), whilst exploiting tactical allocation to other assets, notably risk assets such as equities and property, so as to capture counter trend reversals. * Maximising the potential returns of each of these three strategically appropriate asset classes. These issues need to be considered from a wide range of currency perspectives and all investment criteria, in terms of the global asset and currency opportunity set, noting that the most favourable long term returns and investment opportunities are likely to be found within un-indebted, higher growth economies, such as those in South East Asia. Although a short term US Dollar rally seems likely, international assets will become consequently less attractive. Depositors need to be aware of this from a currency perspective and choose the optimal exit point from any international currencies. Outlook: A sharp retrenchment is expected in the value of risk assets throughout 2012 and 2013. Currency volatility is also expected to increase, leading to both elevated levels of risk and greater opportunities. Zero interest policy causes problems for investors: all that’s gold, does not glitter - The consequence of uninhibited lust for credit, which has defined economic and capital market activity for the last thirty years, is slowly, inch by agonising inch, reaching its inevitable conclusion as both people and nations are starting to learn the hard way about the need to live within their means. Yet the UK, the US and Europe continue pumping billions more Dollars into their economies in a bid to stimulate a recovery, while many other countries have started to follow suit. Most notable and most alarming of these is China, in view of both the sheer scale of its capital base and the worrying inadequacy of Chinese regulatory oversight or transparency. Capital flows have caused unintended consequences increasing the daily cost of many consumer staples beyond the ability of many societies to cope, constrained as they are by their increasingly unequal income and wealth dispersion characteristics. Evidence of this has spread from Athens, through the still continuing Arab Spring, via the streets of many UK cities to the Jasmine riots in China. An intellectual debate continues to rage about what actions the Fed, IMF, ECB and all central banks or supra-national bodies can or should take; whether Federal Reserve Chairman Ben Bernanke’s handling of the Global Financial Crisis (GFC) - based on the narrow and seemingly incorrect historical perspective of monetarist economic theory - can win the day. 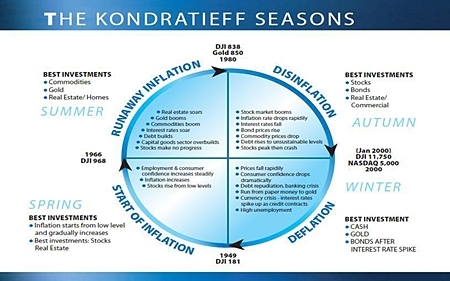 Investors could learn a great deal about the current situation and future outlook by studying long term market cycles - especially MBMG’s Kondratieff Seasons (see graph this page). The policies that have been adopted are justified with reference to economic theory but the justifications provided are spurious and, therefore, investors should not expect better or different outcomes to the previous instances of the global ‘Winter’ phase of the economic cycle. Accepting that cash, gold and bonds are the three strategically appropriate assets for this phase, investors need to understand the challenges associated with each of these. For bonds and gold that challenge is not to get caught holding the time bomb when these asset values fall off a steep cliff, although that may not be imminent. For cash, the test ahead is to get any kind of returns in a zero interest environment. This is a very challenging investment environment but awareness of the larger context will help investors to find the most appropriate solutions. Even proponents of the policies that have taken the global economy to the brink, such as Bernanke’s predecessor Alan Greenspan, admit that these policies are a huge experiment, lacking any scientific grounding or precedent. Indebted western economies currently remain deeply mired in the depths of Kondratieff’s winter despite the unconventional stimulatory economic policy and smorgasbord of bailout packages. The three asset classes which perform best during this winter phase are, as previously stated, gold, bonds and cash. Gold has already risen from below USD250 per oz to a peak of USD1901.35 per oz last year. It has the potential to climb rather higher than that before the end of the winter period, but it also, in the longer term, appears inevitably condemned to fall back below USD1000 per oz, meaning that investors holding gold need to keep an eye firmly on the exit door. Bonds and cash each face the horns of a vicious dilemma. * Which asset classes offer better risk/reward than cash? * How to get the best cash returns? US Bond and T-Bill rates dictate both global interest rates and investment returns, but one month T-Bills now pay annualised interest of just 0.05% and one year bonds just 0.13%, a negative real return once inflation is factored in. The benchmark 10-year note has been gyrating around the 2% per annum level for some time. To get a 3% annual return you have to buy long-dated (30 years to maturity) treasuries with the added caveat of price volatility between now and maturity, i.e. if interest rates increase by just 1% then the capital value of 10-year notes would instantly fall by the best part of 10%. For thirty year notes the price drop would be almost three times as bad. This becomes even worse if interest rates increase more. Bond prices have pretty well reached their apex with interest rates on US Treasury Bills having fallen to almost zero. This is likely to endure for as long as Bernanke & Co. continue to press ahead with flawed stimulus policies. Although negative real rates (interest rates minus inflation) look as though they are here for some time and longer term rates (such as 30-year government bond rates) can fall, especially if manipulated by government policies, interest rates look certain to move higher over time thus pushing down the price of bonds. While this scenario may not be imminent - MBMG’s near term expectation is for prices to continue to increase - it is all but inevitable, and may be dramatic once it takes root, so investors need to know where the exit door is located. Given the heightened risks surrounding investing in gold or bonds, cash emerges as the hardiest asset class in times of economic winter despite the pressure that investors face to chase higher-yield/higher-risk investments. This is the ultimate central bank manipulation and is generally justified by reference to a range of economic theories including The Taylor Rule which is a formula developed by Stanford economist John Taylor in 1993. It was designed to provide central banks with guidance on setting interest rates in response to changing economic conditions by systematically reducing uncertainty and increasing the credibility of the central bank’s future actions through the process of fostering predictable price stability and full employment. One of the key elements of the theory is that any rise or fall in inflation should at least be matched by relative increases or decreases in base interest rates, thereby dampening growth with higher interest rates when growth leads to inflation, or by stimulating economic activity (spending and investment) by cutting rates in times of low growth. As it is not possible for interest rates to drop below zero, an implied negative rate from Taylor’s Rule would seem to justify “printing money” - the introduction of new money supply by central banks, now universally known as Quantitative Easing (QE) - as means of stimulating growth. A problem arises, however, from the fact that in 1999, Taylor wrote a further paper in which he discussed and tested a number of variants to his original theory. It is these variants that have been cited by Bernanke when defending his fiscal and monetary policies. This strongly contrasts with Taylor’s position as he is now distancing himself from these departures to his original theory due to their failure to stand up to historical experience and investigation (see graph this page).